Fairfield, CA’s Manuel “Tino” Avila (23-1 8KOs) is ready to return after a nearly sixteen-month hiatus from the ring as he faces former world title challenger Jose Santos Gonzalez (23-7 13KOs) at the inaugural Thursday Night Fight Series promoted by Golden Boy Promotions at The Avalon in Hollywood, Ca, shown worldwide on DAZN, a sports streaming app, on March 21, 2019. 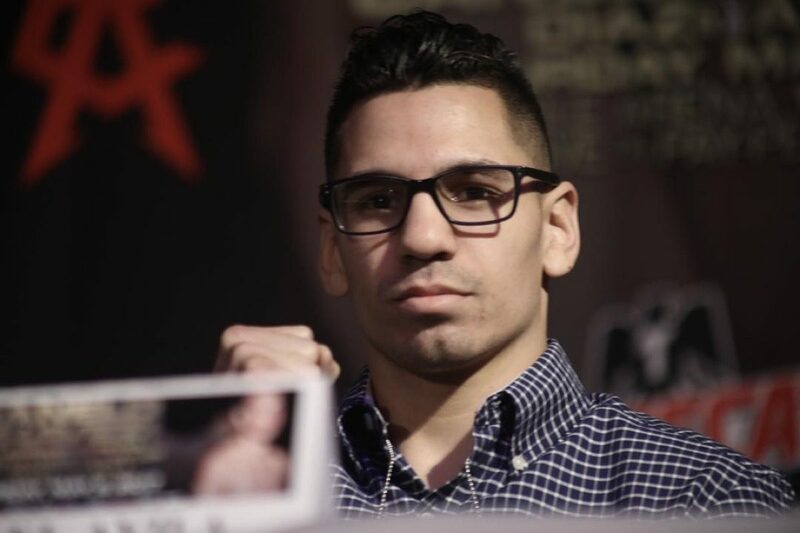 Avila will return after being sidelined for all of 2018 with an injury after a competitive bout against Diuhl Olguin in Maryland. Avila took the time off to properly heal, but never stopped training in the gym as he worked with his head coach Sean Sharkey at FightKore International in Martinez, California, driving an hour and a half round trip daily, just to train. Avila, who holds wins over Ricky Lopez, Rene Alvarado, Yoandris Salinas and Erik Ruiz is looking to bounce back from his lone professional loss which came at the hands of Jospeh Diaz Jr in May of 2017 on the Canelo Alvarez versus Julio Cesar Chavez Jr. fight card in Las Vegas, Nevada which served as the pay-per-view opener. Avila, who signed with Golden Boy Promotions at 18-years-old is currently 26-years-old and ready to make a statement in his career. The featherweight contender currently ranked #9 by the WBC is looking to get a world title shot soon and is ready for anyone in his division. Avila’s opponent is no slouch though as Jose Santos Gonzalez has faced world champion Zolani Tete, blue-chip prospect Ruben Villa IV and recently lost a split decision to Manny Robles III. In short, Gonzalez is full of confidence and has been much more active than Avila in the past year. Avila is also a spokesperson for the Feet First Foundation, a non-profit that focuses on using boxing techniques to help teenagers who are struggling with discomforts in life that are resulting in unsatisfactory behavior at school. Over the past year, Avila has not just grown in the gym, but outside as he has focused on being a role model in the community as well as Avila is more focused than ever to obtain a world title. What do you know about Jose Gonzalez, your opponent for your upcoming fight? How is it be featured on the FIRST DAZN Thursday Night Boxing card presented by your promoter, Golden Boy Promotions? “It is pretty cool to be featured on DAZN. I watch DAZN all the time. I wasn’t expecting to be on DAZN, I really wanted to fight, being on DAZN is a bonus. What are the future fights you’d like to find yourself in? Are you targeting anyone specific? How was this training camp been? What do you know about the opponent, Jose Gonzalez? What does the future hold for “Tino” Avila? Can you explain the Feet First Foundation? The main event will feature Filipino lightweight contender Mercito “No Mercy” Gesta (32-2-2, 17 KOs) will take on Mexican warrior Juan Antonio “El Mozo” Rodriguez (29-7, 25 KOs) in a 10-round main event with the co-main event featuring a battle of unbeaten fighters as Ferdinand “Lucky Boy” Kerobyan (11-0, 6 KOs) of North Hollywood, California will battle Blair “The Flair” Cobbs (9-0-1. 6 KOs) of Las Vegas, Nevada. for the vacant Junior NABF Welterweight Title in an eight-round battle. Tickets for Gesta vs. Rodriguez are now on sale and are priced at $30, $40, $50, and $80, not including applicable service charges and taxes. Tickets will be available for purchase at www.goldenboytickets.com and the Golden Boy Facebook page.